Don’t Despair if You’re Short on Space to Stow Your Gear. We’ve Got You Covered! Many couples, families, and even individuals – particularly Millennials – are enamored of tiny house plans these days. The interest seems to stem from a modern aesthetic that finds simplified life, or a rejection of excessive possessions, attractive. These potential homeowners are on the lookout for house plans that are under 1,000 square feet – often even under 800 square feet. But no matter how much one might want to dispossess his or her possessions, there will still be a plethora of daily-use items to find a place for. Some kind of storage is a necessity. Whether you’ve joined or want to join the movement championing tiny house plans or you’re simply running low on extra space, sometimes you really need to get creative when it comes to storage ideas. Check out these simple, innovative tips to take your storage game to the next level and make the most out of your smallest spaces. If you live in or want to build a tiny house like this 600-sq.-ft. Country-style home plan, you will need creative storage ideas to stow your belongings (House Plan #141-1079). The first rule to creating more storage for small spaces is to look for any areas where you can add additional shelves. 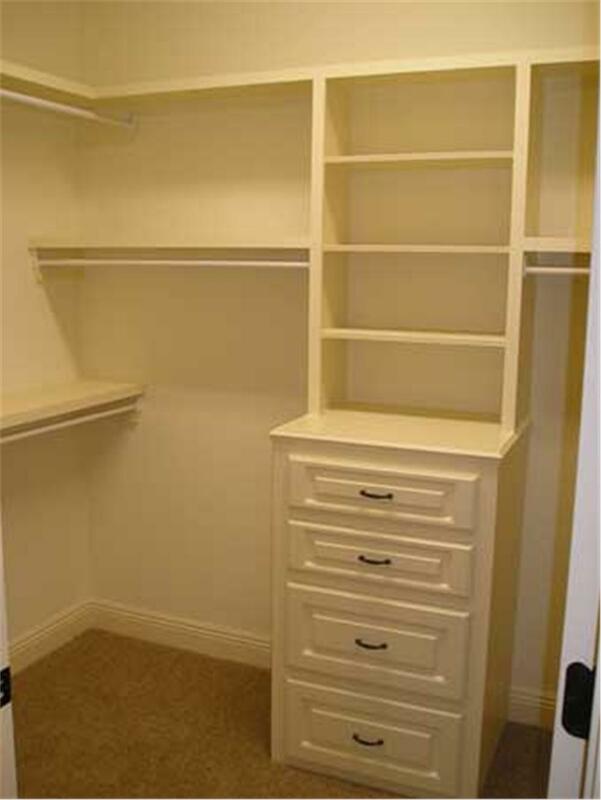 Start with closets that have high ceilings or mud rooms that have bare walls becuase these are usually where you can benefit from storage the most. This also opens you up to some great design possibilities in your floor plan becuase you can match the size and style of the shelves to the decor in the room. Shelving is one of the most important basic storage tools and can make a difference high on a wall and out of the way (above) and, of course, in closets (below). You’d be surprised at the amount of space that you can reclaim in your floor plan by adding a storage solution to the back of a door. Running out of space for all of your shoes? 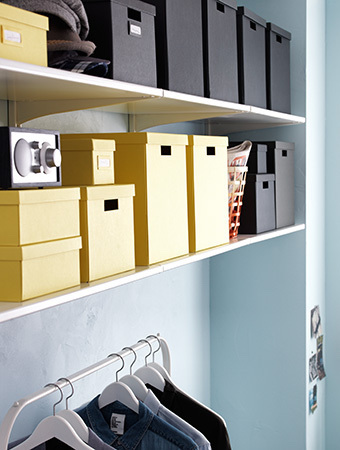 Use a hanging closet door shoe organizer to get them off the floor and keep every pair together. Or use a shoe organizer to hold anything that will fit (photo below)! You can also find smaller shelves and racks to install on the backs of cabinet doors for spices and other kitchen utensils. Hanging organizers are just the beginning, because virtually every item in your home floor plan is a candidate for suspension storage. 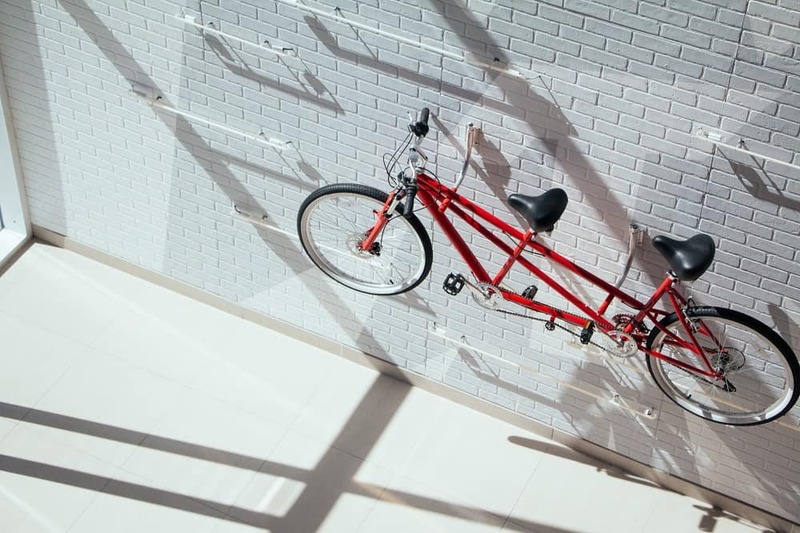 Wall and ceiling mounts make it possible to store and display larger items like musical instruments or bicycles. You can even turn your storage ideas into statement pieces by setting them up in a prominent room. Sometimes, as here, the best tiny house is like a studio apartment but bigger, with the bedroom, living area, and kitchen open to each other. Creative storage like these wall brackets – and the items they hold – can become part of the decor. If you don’t have built-in bookcases in your tiny house plan, don’t fret. You might have another built-in feature that’s just begging for a new creative interpretation. Maybe you have a decorative fireplace that you could transform into a miniature bookshelf? Take a look around your house floor plan, and you’ll likely to find more than a few such spaces that you could easily turn into some fun and unexpected storage. 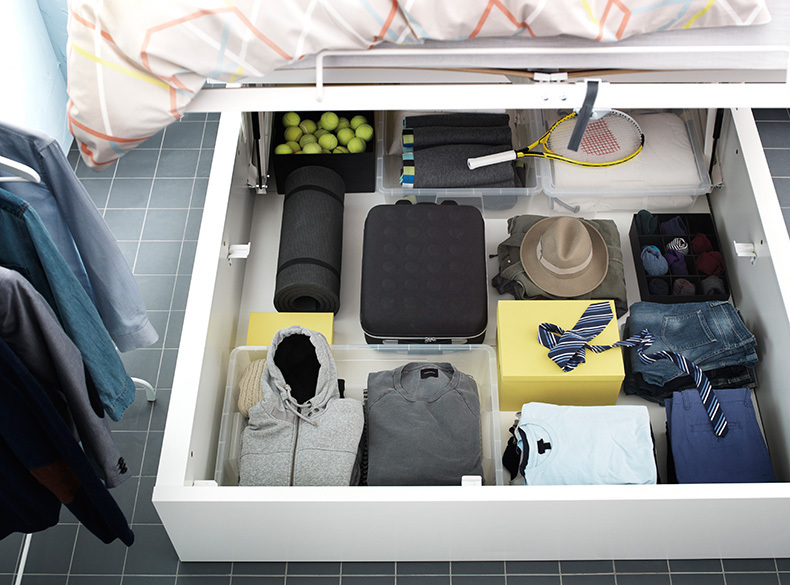 Looking for every extra square inch you can find for storage? 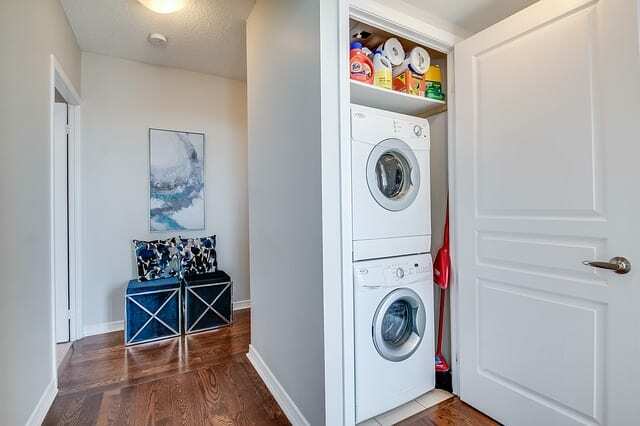 Here, the stacking washer and dryer are put into a hallway closet and every inch of storage is put to good use! Many tiny house plans don’t include much closet or bedroom storage, but you can create your own with the use of under-bed boxes. These flat storage bins can be perfect for stowing away seasonal clothing like sweaters or swimsuits in the off season. 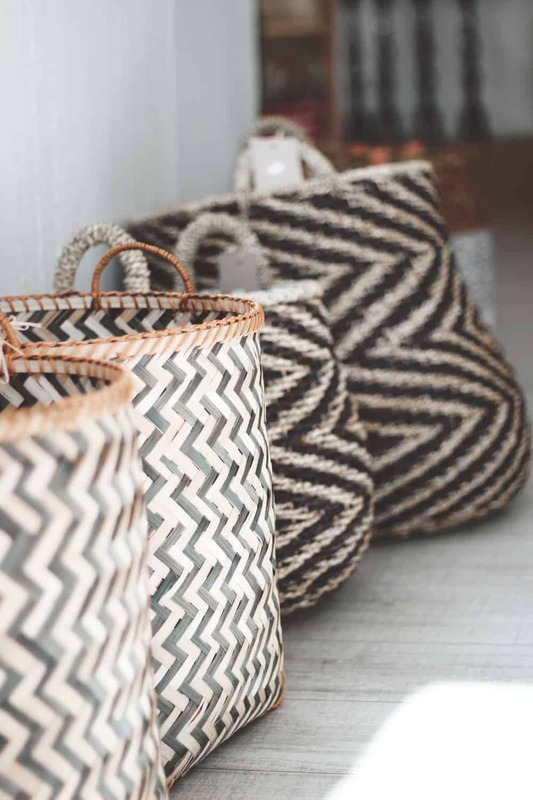 Depending on the size of your bed and the clearance, you could also use them for your everyday clothing, your shoes, or even your spare linens. One of the easiest, and most effective, ways to enhance the storage for small spaces is through furniture with hidden storage compartments. It might be an ottoman with a lift-off lid or a bench seat that doubles as chest. There are even special beds that come with built-in drawers underneath (called a captains bed), or beds that lift up to reveal even more storage space. You can usually find these at many furniture stores without much extra effort. The one below comes from Ikea. 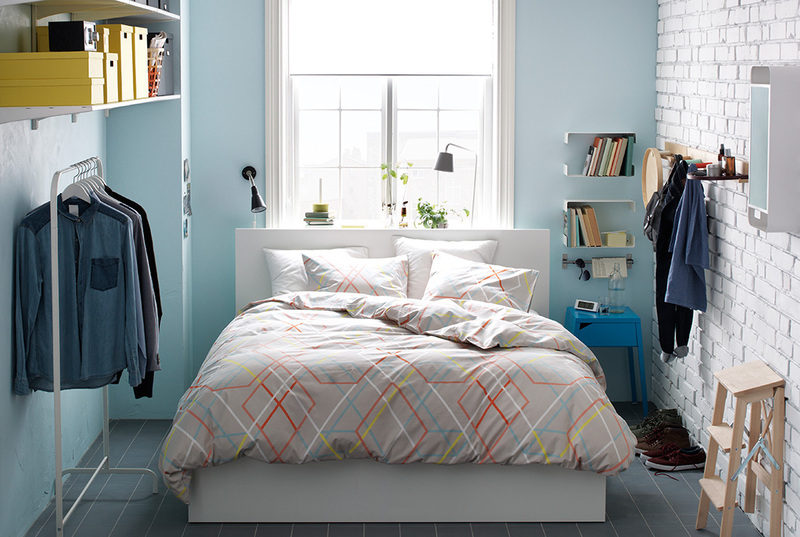 This bed in a space-efficient bedroom (top) hides a storage-area treasure trove (below) for the space challenged. Doors are wonderful for privacy and separation, but can create some problems when it comes to making the most of your storage space. Removing a closet door can give you more room inside to install shelves or other storage solutions, as well as give you more options for how you incorporate it into your overall home design. This also means that you don’t have to sacrifice the floor space that the door would eat up when opened, so you can maximize each room’s potential. Tables can be a lifesaver in the laundry room, but can also lead to a lot of wasted space. Try adding some baskets underneath the table to add some much needed additional storage, and even some extra organization. You could use the bins to separate your darks from your lights, collect your bulky linens for a separate load or even create a designated spot for your kid’s sports gear (so they don’t just leave it all over the floor). This small laundry room, a luxury in the typical tiny house floor plan, puts shelving, baskets, and cabinets to good storage use. Pretty much every room in your house floor plan can receive a major storage upgrade from a peg board. You could use it in your kitchen to hang your pots, pans, and utensils on the wall. Adding one to your garage or mudroom could help organize tools and keep them from taking up space all over the house. Another idea is to add them to your children’s rooms so that they can have customizable storage for their jackets, back packs, or more. You can paint and decorate the peg board however you like, so you can really make it match any room’s aesthetic. Even the largest of homes can suffer from cramped showers, and one of the best ways to combat this (in a tiny house plan or any other) is by using a shower caddy. Instead of lining the edge of your tub with bottles, soaps, and more, you can centralize them in one convenient location for easy access. There are many different styles and models out there, so you should be able to find one that matches your shower and your needs perfectly. You don’t have to live in a tiny house to face problems with where to put all of your bathing and showering needs. Shower caddies free up other space in the bathroom and are the perfect answer! Sometimes the best way to make more space is to combine two areas into one. A few tables in your laundry room can help you transform it into a dedicated crafts space. A shallow closet in the floor plan could become a miniature office, or your kitchen island could pull double duty as a dining table with a few stools. This is a license to let your creativity run wild, so there’s no need to hold yourself back. Finding a way to add extra functionality to an existing space could even be a project for the whole family. Looking for more storage ideas for your tiny house? Make sure to check out our fantastic selection of house plans for inspiration and a fresh perspective. 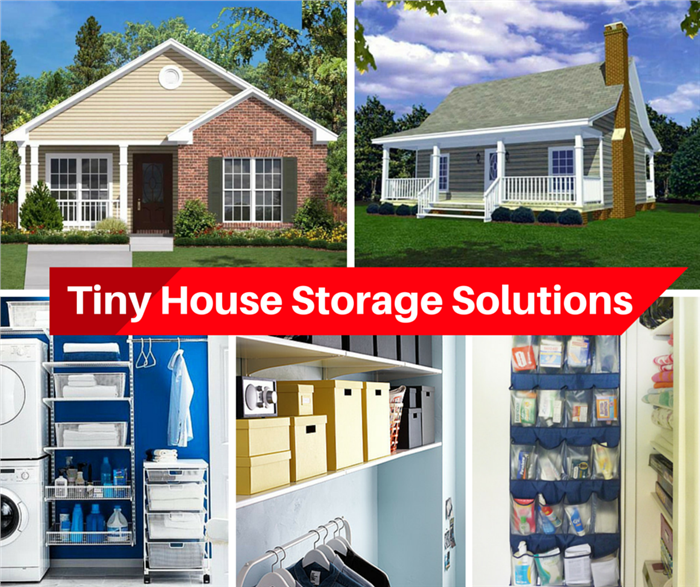 And don’t forget to share your tiny house storage tips and secrets in the comments below. Footnote: The lead image shows two tiny house plans. The one at left is an 850-sq.-ft., 2-bedroom Traditional style home plan (House Plan #142-1031). For more information, click here. The house on the right is an 800-sq.-ft., 2-bedroom Country Style home plan with a front and rear porch (House Plan #141-1184). For more information, click here.